Sarah Glassford and Amy Shaw (eds. ), A Sisterhood of Suffering and Service: Women and Girls of Canada and Newfoundland during the First World War (Vancouver: UBC Press, 2012). What intrigues in recent scholarship on the First World War is the degree to which contemporary scholars are willing to challenge prevailing, generally oversimplified war narratives. Not only have the wider theatres of war been re-assessed beyond the Western Front, but pervasive ethnic biases in previous scholarship have also been confronted and critiqued. These are important critiques, especially in light of the crucial roles played by Chinese labourers, African soldiers and labourers, Indian troops and in Canada, Aboriginal participation. Crossing these ethnic and geographic divisions, however, is the role of women and children, both of which have received scant attention in the military histories in Canada. Sarah Glassford and Amy Shaw’s edited collection of essays, A Sisterhood of Suffering and Service, is an overdue contribution to the immensity of women’s contributions from 1914 to 1918 and beyond. The book consists of twelve essays, contained by four sections covering the mobilization of women, the types of work they performed, their family concerns and their authorial responses to wartime experiences. As Shaw and Glassford state, women “were not bystanders in the Great War.” While women most often supported the absent men and ultimately returned to traditional gendered roles in the aftermath of the war, the doors they opened for themselves in the worlds of work, as well as important political and social spheres that bridged class lines, ethnicity and age groups provided newfound senses of self-worth. In this way, these essays contribute both to our wartime knowledge and to our sense of women’s history. The mobilization section sets the tone of the book. The first two essays by Alison Norman and Margot I. Duley discuss women’s patriotic organizations on the Six Nations Aboriginal reserve near Brantford and in Newfoundland, respectively. In general they come to similar conclusions about organizational methods, motivations for support, and types of products they contributed to the war effort. In both cases, these followed from traditional gender lines: Iroquois women traditionally outfitted their men for war, while in Newfoundland knitting socks for soldiers (amongst other concerns) was a nationalization of established domestic norms. In both cases, newfound political power was exercised: the Iroquois women could resist the all-male Band Council, while Newfoundland women saw their domestic work achieve real public and economic value. Terry Wilde complicates the matter of mobilization still further by considering the activities of mostly upper-crust women at the University of Toronto and how war presented them with unique opportunities, a louder and more appreciated campus voice for a time, and also some long-term gains like dramatically increased enrollment. There is no illusion of ethnic parity in these essays, however, as demonstrated by a smallpox outbreak in the greater Brantford region resulting in only Iroquois-made socks being refused. Clearly, as Wilde rightly points out, establishing a new social order is extremely hard work. 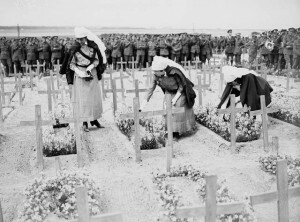 Nursing sisters decorating Canadian graves, 30 June 1918, unknown location. The other sections of the collection demonstrate similarly nuanced interpretations of the lives of women at war. The section entitled “Women’s Work?” discusses women’s professional opportunities primarily, including volunteer nursing, munitions work and banking. Firstly, one discovers a pre-existing desire of women to enter the workforce, as those who had striven to legitimize nursing as a profession were protective when volunteer nurses (VADs) entered wartime service. 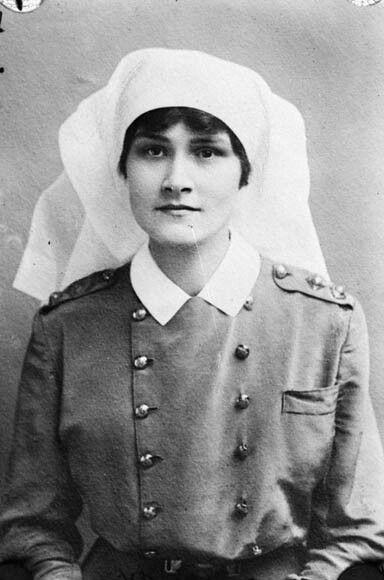 Moreover, as Linda J. Quiney notes, nursing was popularly conceived as a form of female soldiering and in that regard, as Terry Bishop Sterling argues, many of these young women had very similar experiences as the men in the realms of bloodshed and viscera with which they contended nearly every day. These women also shared similar leisure experiences of touring England and going to revues, concerts, and restaurants. Kori Street’s contribution to this section looks at munitions and banking work against the backdrop of labour shortages. Unlike the previous sections outstanding emphasis on ethnicity, Street’s essay clearly demonstrates that regional issues dictated opportunity, while also showing that unlike the political sphere outlined in the previous section, women were never viewed as long-term options in either banking or industry. The third section of the book deals with the family, but it also features one essay on Canadian girlhood. This essay, by Kristine Alexander, deals with the propagandizing of innocent girls as an enlistment tool, while the other two in the section are by Desmond Morton and Suzanne Evans, respectively covering government policy toward families and the trappings of grief and mourning adopted by women. 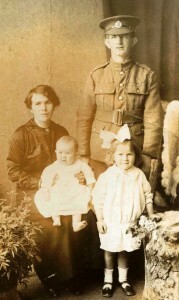 Together these three essays demonstrate how women and girls in Canadian society prompted strong responses by the state, either as symbols in the case of Alexander and Evans, or in Morton’s argument the recognition that untended families of servicemen presented a serious political dilemma for the nation. Alexander shows that girls were “in need of protection,” while Evans outlines how tropes of mourning changed from symbols of loss to being “presented, with a positive turn, as sacrifice.” In each case, one encounters romantic ideals of girlhood and womanhood appropriated by the state and turned toward nationalistic goals. Such revelations, in conjunction with the first sections of the book, demonstrate how this narrative of “suffering and service” comes about, as a set of practices and a set of ideals. Morton’s argument also sees the state taking a serious and even intrusive look into the homes of servicemen. In so doing, they tried to assist with the continued economic viability of the household while men are away while discovering, simultaneously, that the Canadian family was not nearly as simple as believed. The final section deals with literary responses to women’s roles and, in frankness, it is the least inspiring. This is not because the ideas were necessarily lacking in substance, but rather because by the time I had reached this point of the book I had already encountered the motifs discussed in these essays by Vicki S. Hallett, Lynn Kennedy and Amy Tector. More importantly, I had seen how they manifested in practice and not solely as literary tropes, thus evoking questions of historical method rather than themes. That said, literature is clearly an important historical source: poetry was the dominant literary form of the day, and was a formative literature of empire, and national identity and character. In keeping with this key idea, Hallett recounts Newfoundland poet Phebe Florence Miller’s explorations of stoic womanhood, as well as her proud use of local references for her Newfoundland readership. Tector’s article is the one that stretches the motifs best, delving into male authors’ threefold portrayal of women as mothers, lovers and nurses, within the literary setting of women caring for disabled veterans. Tector convincingly argues that these male authors were warning of the perils of inverted gender dynamics, focusing on women’s subversive power over their wounded and often infantilized charges. In other words, Tector sets her analysis against the broader historical backdrop of veterans’ anxieties in ways not quite accomplished in the two other essays. The Lloyd family. 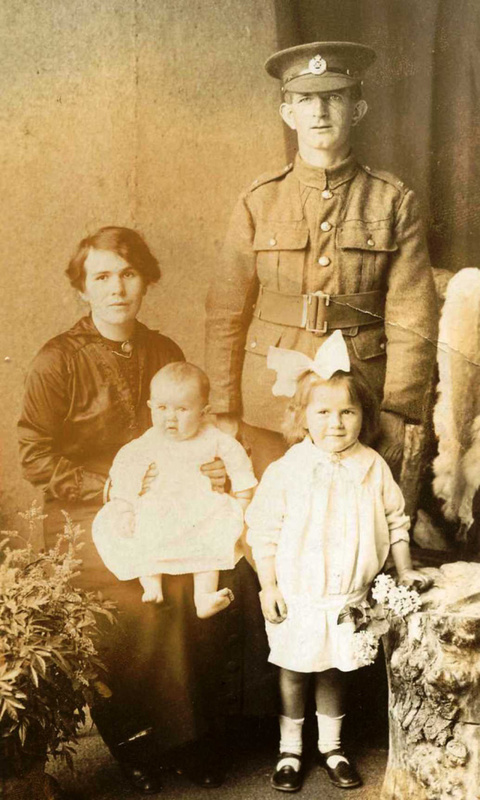 Mrs. Lloyd, like many servicemen’s wives, was forced to find new support for hearth and home during her husband, John’s absence and subsequent wounding on the Somme. It should be evident that this essay collection is exemplary in many ways, eschewing simplified narratives in favour of complexity, not reducing any questions to matters of gender alone, and so on. Still, there are weaknesses in the collection that will hopefully inspire new writings. The most obvious problem is the collection’s title, which promises work on girls’ history, but of which it fails to deliver in any substantive quantity. This is simply misleading, unlike the other sections in which historians provide ample comparative materials. Morton’s article on family policy, while showcasing the government side, also needed some focus on the social impact of men being away from home. In many soldiers’ letters there is much consternation about finances and tending to matters at home (gardening, house repairs, and the like). Such references provide a perfect opportunity to “read between the lines,” as women’s historians often must do, but this time without the paucity of sources that so often plagues the writing of women’s history. These are but two critical opportunities for further study, with others including stronger regional comparisons, incorporation of more ethnic and class considerations, and even the effects of changing women’s roles on consumer society, religious participation, and education. Overall, Glassford and Shaw have collected an excellent set of essays, while also assembling a framework for future inquiry that is expansive, laudable, and highly recommended reading for scholarly and lay interests alike. One thing is certain in reading this collection: the idea of Canada’s birth as a nation is surely complicated by expanding the analysis beyond Vimy and other primarily masculine experiences. 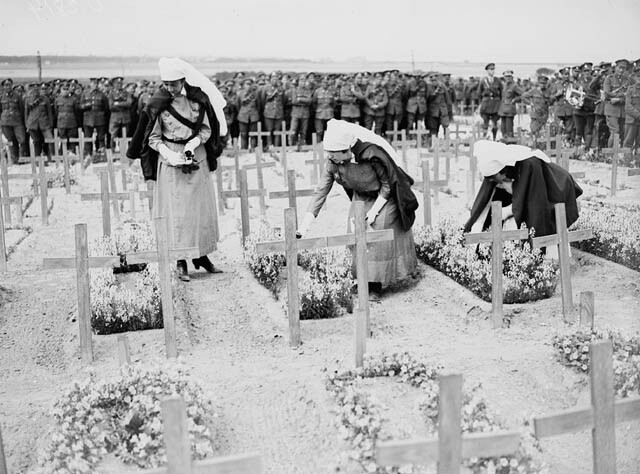 Women’s contributions to the war remain understudied in just about every nation, yet it is abundantly clear that their participation was fundamentally important to both the war effort and to what became of Canadian societies in the Great War’s aftermath. Far from a fad, women’s history here shows its sophistication and complexity, defying the pejorative associations made by media pundits, and situating itself as a history of empires and nations, of political history, of economic history, and of military history. In the case of breaking down Anglo-French-German biases, see Santanu Das’s recently edited collection of essays entitled Race, Empire and First World War Writing (Cambridge: Cambridge University Press, 2011); and the international conference on Chinese workers on the Western Front, hosted in 2010 at Boulogne-Sur-Mer and Ypres: http://www.iccwww1.org/Conference-2010/Home.html. A brief Google search reveals any number of recent conferences about the Eastern and Southern theatres of war, while University College Dublin’s Centre for War Studies lists at least three conferences in the past two years addressing international perspectives on the First World War beyond the traditional theatres of war: http://www.ucd.ie/warstudies/conferences/previousconferences/. Sarah Glassford and Amy Shaw, “Introduction: Transformation in a Time of War?,” A Sisterhood of Suffering and Service: Women and Girls in Canada and Newfoundland during the First World War, Eds. Sarah Glassford and Amy Shaw (Vancouver: UBC Press, 2012): 2. Respectively, in Alison Norman, “‘In Defense of Empire’: The Six Nations of the Grand River and the Great War”: 30; and Margot I. Duley, “The Unquiet Knitters of Newfoundland: From Mothers of the Regiment to Mothers of the Nation”: 53. Terry Wilde, “Freshettes, Farmerettes, and Feminine Fortitude at the University of Toronto during the First World War”: 82-90. 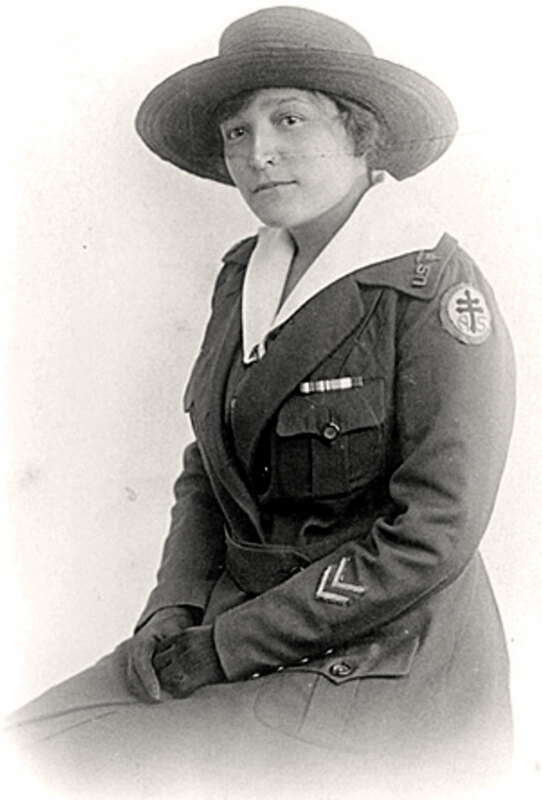 Linda J. Quiney, “Gendering Patriotism: Canadian Volunteer Nurses as the Female ‘Soldiers’ of the Great War”: 108-9. Terry Bishop Sterling, “‘Such Sights One Will Never Forget’: Newfoundland Women and Overseas Nursing in the First World War”: 135, 141. Kori Street, “Patriotic, Not Permanent: Attitudes about Women’s Making Bombs and Being Bankers”: 153. Kristine Alexander, “An Honour and a Burden: Canadian Girls and the Great War”: 175. Suzanne Evans, “Marks of Grief: Black Attire, Medals, and Service Flags”: 220. Desmond Morton, “Supporting Soldiers’ Wives and Families in the Great War: What Was Transformed?”: 205. Lynn Kennedy, “‘’Twas You, Mother, Made Me a Man’: The Motherhood Motif in the Poetry of the First World War”: 273. Vicki S. Hallett, “Verses in the Darkness: A Newfoundland Poet Responds to the First World War”: 256, 258. Amy Tector, “‘Mother, Lover, Nurse’: The Reassertion of Conventional Gender Norms in Fictional Representations of Disability in Canadian Novels of the First World War”: 303.